I have developed a love for grits. Never had them as a child or adult until a few years ago. Plain grits taste like wallpaper but flavored grits are delicious. This is my recipe for cheese grits. It is fast and easy. Add the salt then the grits. Whisk and then whisk again till done. Turn the heat to medium, cover and let cook for 5 minutes. Taste to see if the grits are soft and cooked. One large can diced tomatoes with the juice. Saute the onion and garlic in two tablespoons olive oil till soft. Add tomatoes and reduce the liquid till the tomatoes are thick. Season with salt and pepper. Put the tomatoes around the edge of the dish. Fry, scramble or poach an egg and place the egg in the center of the dish. 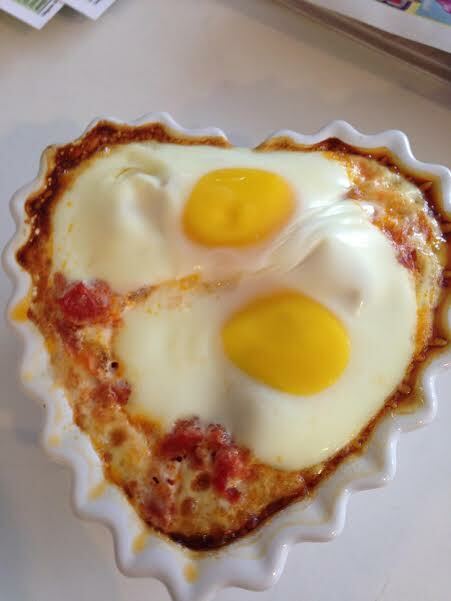 I make four to five portions with this recipe and put two eggs in every ramekin. Add whatever garnish you like. Fresh diced scallions, cilantro, fried onions. I baked the eggs in the picture and they became rubbery. Made it a second time without baking the eggs and it looked just as pretty and the eggs were delicious.